Acting Defense Secretary Pat Shanahan, left, arrives in Kabul, Afghanistan, Feb. 11, 2019, to consult with Army Gen. Scott Miller, right, commander of U.S. and coalition forces, and senior Afghan government leaders. The Pentagon's Office of Inspector General has launched an investigation into allegations that Acting Secretary of Defense Patrick Shanahan violated ethics rules by promoting his former employer, Boeing, while serving in the Trump administration. The watch group Citizens for Responsibility and Ethics in Washington filed an ethics complaint last week claiming that Shanahan had appeared to promote Boeing and disparage former competitors such as Lockheed Martin in his statements. 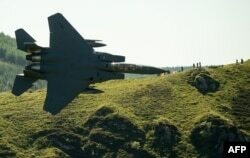 Military aircraft enthusiasts watch as a United States Air Force (USAF) F-15 fighter jet as it travels at low altitude through the 'Mach Loop' series of valleys near Dolgellau, north Wales on June 26, 2018. One example listed in the complaint was the allegation that Shanahan pushed the Pentagon to buy more Boeing-made F-15X fighter jets over other fighter jets made by Boeing's competitors. The Secretary's office issued a statement Wednesday asserting that "Shanahan welcomes the Inspector General's review." "Acting Secretary Shanahan has at all times remained committed to upholding his ethics agreement filed with the DoD.This agreement ensures any matters pertaining to Boeing are handled by appropriate officials within the Pentagon to eliminate any perceived or actual conflict of interest issue(s) with Boeing," the statement read. Shanahan served as deputy secretary of defense at the Pentagon after spending more than three decades at Boeing. FILE - Jim Mattis, U.S. secretary of defense at the time, is seen arriving for a meeting at NATO headquarters in Brussels, Belgium, Feb. 14, 2018. 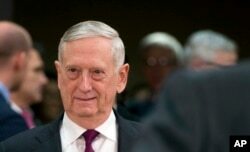 He stepped into the role of acting secretary of defense after former Defense Secretary Jim Mattis resigned on Dec. 20, saying in his resignation letter that President Donald Trump had the "right to have a secretary of defense whose views are better aligned" with his. The president decided to replace Mattis before his expected resignation date, tapping Shanahan to take the post as of Jan. 1, 2019. Shanahan has had to repel questions about potential conflicts of interest since taking office. Last week, he told Congress he welcomed any such investigation into his actions at the Pentagon. In January, he called claims of favoritism "just noise."